In the beginning, nobody ever thought that blogs would transform from a personal diary to full-fledged money-making websites. Blog monetization strategies have undergone several transitions during these years and bloggers have tons of monetization options at their disposal. One of the options is running direct advertisements on the blog. Interestingly, a large number of bloggers does not use this option for many reasons. If you're a professional blogger, the following guide will help you master the basics of grabbing direct adverts. Remember, the more you'll be flexible in the beginning, the more will be the probability of your success. The methodologies discussed below are more or less applicable to almost every type of website regardless of the underlying platform, running it. In most cases, you'll need a self-hosted version of your blog to easily integrate direct ads at the desired places. Let's try to understand the dynamics of web-based direct advertising and the methods to grab such direct advertisement deals. 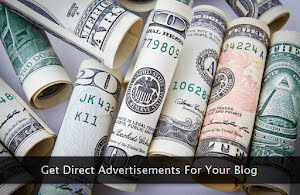 If you own a blog with decent traffic (at least 500-1000 unique visits/day) and are planning to monetize it, direct advertising is an excellent option for you. Quality content and good organic traffic are the two most important prerequisites before pitching for direct advertising. Cuts out the middleman - Almost every blogger who has monetized his/her blog is surely familiar with PPC (pay-per-click) ads available via popular 3rd party advertising networks. Since they act as a middleman between the advertiser and the publisher, they take a good share of the revenue. On the other hand, getting direct ads from advertisers removes the middleman, and you, as a publisher get the full incentive for your services. Flexibility for the type of ads - You can offer almost any type of ad format for the advertisers when pitching for the direct ad slots. With 3rd party advertisement platform, you have limited choices with some predefined standard ad formats. Through direct advertising, you can offer a wide array of ad formats with much more flexible ad placements. Following are some popular advert types preferred by the advertisers. When you are in complete control of ad customization, advertisers get more variety and options to choose from that suits their business demands. Flexible payment options - Another advantage is the flexibility of payment methods. If an advertiser is not willing to pay by one method, you can offer an alternate way. Normally, bloggers prefer wire transfer or PayPal as the best method to get payments from the advertisers. Still, if an advertiser chooses any other payment medium, you can be flexible and can go ahead with his preferred option to seal the deal, easily. Long-term relationships - More than often, bloggers develop long-term relationships with advertisers who are satisfied with their service. This not only opens the door for a consistent stream of income from these advertisers but also increases the probability of grabbing more advertising deals through referrals of these satisfied customers. Flexible pricing - Since you are in complete control of your ad inventory, you can exercise extreme flexibility while quoting the price of different types of ads to grab almost every advertising deal coming in your way. Builds Credibility - A blog that gets consistent direct advertisement deals automatically builds its credibility and is seen as an authority in its niche. This also aids in getting future deals. Difficulty in finding advertisers - Initially, a lot of effort goes into finding advertisers for the blog. Sometimes, it may take considerable time before any such deal is finalized. Once you start getting the deals, things become easier though you still have to move your legs aggressively to clinch new deals. Time consumption - Keeping track of ad inventory, negotiating deals with advertisers, keeping track of payments, and time deadlines consume a lot of precious time of the blogger. If you have multiple blogs that are updated daily, things can become more difficult as considerable part of your blogging schedule will be spent on maintaining your ad inventory and in finding new advertising deals. Disputes - Sometimes, an advertiser is not satisfied with the results and may nullify the agreement from his end demanding a refund of his payment. This can also lead to negative feedback from other advertisers in the pool. One can argue to include a nonrefundable clause in the deal's agreement. But, it can backfire and you can lose the opportunity even before the deal matures. Before you decide to approach advertisers, you must do some very important preparations to increase the probability of clinching your first direct advertising deal. Create a dedicated advertising page - An advertising page summarizes all the necessary information needed to convince potential advertisers (kind of a portfolio of your blog). This page tabulates the most important statistics about your blog. In simple words, this page gives all the reasons why an advertiser should choose your blog for his services or products. Following are some of the essential ingredients of a typical advertising page. About section - This important section gives a brief introduction about your blog. What it's all about, it's niche, target audience, and the purpose of its existence (reader's perspective). Traffic statistics - The most important part of an advertising page is this very section. Give all the important data related to your blog traffic to convince the potential advertisers. Following are some major blog statistics that are commonly displayed on an advertising page. Some advertisers don't give much importance to Alexa and similar ranks but others do take them into consideration, so it's better to include it in your traffic statistics section. Similarly, providing concentrated demographic data increases the chances of getting a certain type of advertising deals. Available ad slots - In this section, the available ad inventory is showcased. This includes each ad type, their format, their exact placement, and the number of such slots available for any location. To give a clearer picture you must supplement this section with appropriate snapshots of ads placed at a specific location. Now here comes the tricky part. What about the pricing of ads? Should we straightaway quote the price of each available ad slot? Well, I would strongly suggest you keep your cards, closed. Let the advertiser contact you with relevant details and then you can play your cards according to the situation. Ask for advertiser's website address when he first contacts you. This way you can visit their website and can get a fair idea about their budget and purchasing power. Through this approach, you create an opportunity for yourself to assess the situation and then create a flexible pricing plan. If you publicly display your ad prices, websites with the considerably low budget may not approach you and big websites may grab it at the much lesser rate then what they were willing to pay earlier. Testimonials - Great marketers use their customers' feedback to promote their products. The same rule applies here. Get some testimonials from your satisfied advertisers and prominently display them on your advertising page. This builds your credibility and shows your track record of giving excellent advertising services. Apart from publishing the plain testimonial statement, you can further replenish it by including a thumbnail image of the person with his/her designation. Often newbies are in dilemma about setting the correct price for their direct advertisements. Sometimes, they fear that quoting a high price can result in loss of an advertising deal while quoting less will be like giving their real estate, in pennies. How to overcome this situation and how to correctly calculate the prices for your ad inventory? Here are some basic guidelines to calculate ad prices. Image vs text ads - Normally, image ads are always priced higher than text ads. The CTR (click-through rate) of image ads is much higher than text ads and hence this pricing difference. Size does matter - Larger the size of the banner, higher the price is. If a 125x125 pixel image banner is priced at $30/month, a 250x250 pixel banner should be priced at 2 x 30 = $60/month. Placement - If the advertisement appears above the fold (area visible without the need of scrolling), it is priced much higher than those ads that appear below the fold. If an ad is going to appear in the footer, its price will be considerably low than that placed in the header of the blog. Pricing model - There are two popular pricing models for advertisements. The CPM (cost per thousand impressions) model and the CPA (cost per action) model. The CPM model is the preferred way to calculate ad prices and is a widely accepted model throughout the blogosphere. In this model, a fixed amount is paid for every 1000 pageviews. It's as simple as this. But, how would you calculate the right price for a particular ad in this model? Here are some ways to do it. The best way to get the correct value of an ad is to check public ad inventories and see their CPM rate. Log in to your AdSense account and go to advanced reports to view the CPM rate for a particular ad. Take at least a month-long data set to get the clear picture, though a long-range data will give a much more accurate rate. Let's suppose you get a CPM rate of $1.20 from the report. Now, according to your assessment of the purchasing power of the advertiser, you can increase or decrease this rate. A low budget advertiser can be offered a rate of $1.00 or $0.80, while a big website can be asked for a CPM rate of $1.50. Let's assume that the deal is finalized at a rate of $1.50 CPM. How the monthly rate will be calculated? Suppose your blog generates 5000 pageviews per day. This amounts to 30 x 5000 = 150000 pageviews per month. So, at this rate, the price of the ad will be (150000 / 1000) * 1.50 = $225/month. If you are still in a dilemma, you can also ask an expert to assess your blog's worth. Now comes the really tough part (at least for newbies) of finding advertisers for your blog. There are several ways to do it. Visit marketplaces - There are several popular forums and discussion boards where advertisers and publishers meet solely for the purpose of finding and negotiating advertising deals. You can visit Digital Point - Buy, Sell or Trade Forum or Webmaster World Commercial Exchange Forum to find advertisers for your blog. Check competitors' blogs - Visit popular blogs related to your blog's niche and see who is advertising on these blogs. This is a good source of creating a list of potential advertisers. Since they are already advertising on a blog related to your blog's niche, a chance of clinching a deal from these advertisers is more likely to happen. Check public ad inventories - Some 3rd party advertising networks give the public access to their inventory to account holders. Sign-up for these ad networks and browse their ad inventory. Again, filter out advertisers related to your blog's niche. Here, not only you can get a list of potential advertisers but can also get a fair idea of how much they are willing to pay. Write a blog post about it - This is one more way to attract advertisers. Write a blog post explicitly stating that your blog is now open for direct advertising. If you have a large subscriber base, you'll surely get some leads. Search engines - And last but not the least is the use of popular search engines. Type in relevant keywords and visit the relevant websites. Check out their contact pages and create a list of potential advertisers. Once you have the list of potential advertisers in your hand, it's time to contact them inviting to advertise on your blog. Write a mail giving your brief introduction. State your purpose of writing in brief. To speed up the process give your phone number and the instant messaging handle. Attach the media kit/rate card showcasing various advertising options available on your blog. It's somewhat similar to the mobile version of the advertising page already published on your blog. Make sure that this document must contain detailed pricing of every ad type available in your inventory. You must also quote discounted prices for long-term deals. One more convincing methodology is to give limited period read-only access to Google Analytics dashboard to verify your traffic claims for long-term deals (6 months or more). This offer increases the trust of the advertiser and the probability of clinching a deal also increases by many folds. If this is your first advertising deal, be ready to be flexible enough while negotiating to the price of your ads. Remember, your first deal will open the door for more such deals. Let's once summarize this guide to quickly pick up the key points. In a nutshell, direct advertising should only be considered when your blog publishes exceptional content, receives a good volume of organic traffic, and have a decent subscribers base. Be flexible when negotiating direct advertising deals. Provide a wide array of ad formats to let the advertiser pick his preferred option. Be flexible with payment methods too for advertiser's convenience. Be ready to share web analytics data with the advertisers for large deals. And last but not the least, offer discounts to returning advertisers.